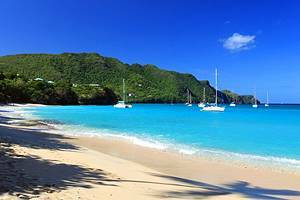 St Vincent and the Grenadines offer some of the most beautiful scenery in the Caribbean, with pristine, palm fringed white sand beaches and undeveloped and uninhabited islands. St Vincent features small towns and villages that welcome visitors without an overwhelming focus on tourism. Private islands and resorts offer quiet escapes where a person can find a beach all to themselves. These islands are very popular with yachters, with smaller boats being the best way to see some of the attractions. There are also many good snorkeling and dive sites. The main population center is Kingstown, the capital city located on St Vincent. Here colonial buildings line the cobblestone streets and Fort Charlotte, high above the town, looks out over the surroundings. The St Vincent Botanical Gardens, dating back to the 1760s, are the oldest such gardens in the West Indies with mature trees and tropical plants. There are some interesting sites around the island of St Vincent. Visitors can hike into the Falls of Baleine and enjoy a swim at the base. The Leeward Highway between Kingstown and Richmond Beach is a scenic stretch that runs past beaches and villages, with nature trails at stopping points along the way. The Windward Highway, along the east coast, offers more dramatic scenery along the Atlantic Ocean. The main population center on this side of the island is Georgetown, although there is little of interest here for tourists. The most interesting site on this side of the island is the volcano, La Soufrière, reaching a height of 1234m/3949ft. For the adventurous, a hike leads to the crater rim. The Grenadines are the real highlight, including the islands of Mustique, Mayreau, Canouan, Bequia, Palm Island, Union Island, and the picture perfect Tobago Cays. Some of these islands, such as Mustique and Palm Island are privately owned. Mustique is the most ultra-exclusive, frequented by movie stars and famous people from around the world. The tiny Palm Island is home to a small resort that is open to the public, and beautiful beaches spread around the island. 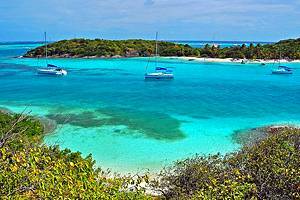 The group of small uninhabited islands that make up the Tobago Cays are part of a marine park, with shallow turquoise water and white sand beaches, perfect for swimming. Most of these areas can be easily accessed by water taxi or yacht from Union Island, which itself, has lovely beaches as well as tourist amenities.